Most major brands are monolithic, tightly controlled, and resistant to change. We at Adobe view our brand differently. 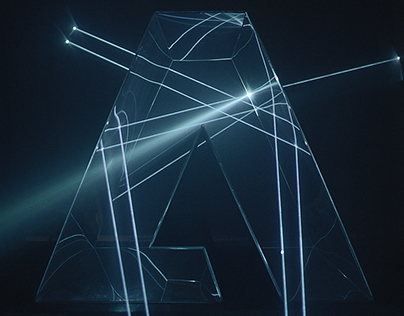 At Adobe, we believe that everyone has a story to tell—from emerging artists to global brands—and we aim to be the company that enables and empowers these storytellers to turn ideas into action. 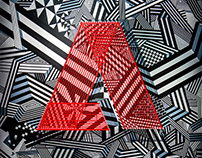 The Adobe Remix program is a unique program in that we invite our community to bring their individual or collective voice to life through our corporate mark. We bring them inside our brand, exposing our most sacred brand asset—our logo—asking them to put “their mark” on ours. Vasjen Katro, a.k.a Baugasm, is a visual designer from Albania. 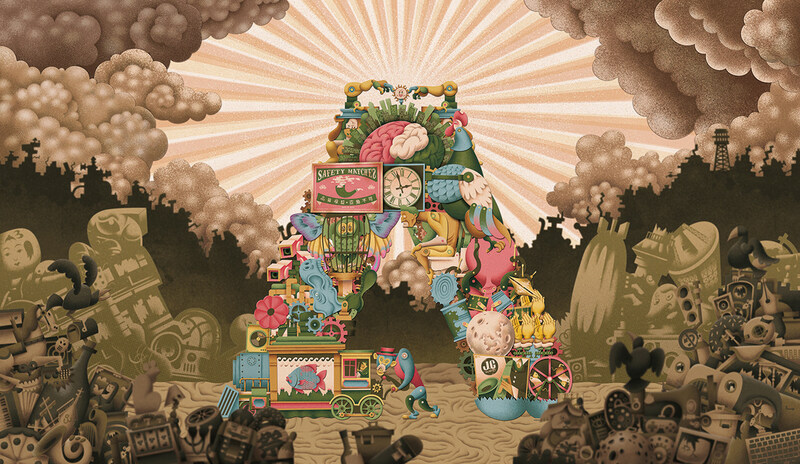 For his Adobe Remix, he added a new ingredient to his process—artificial intelligence (AI). Drawing inspirations from sci-fi movies and van Gogh paintings, Vasjen worked with our Research team to leverage style transfer technology powered by Adobe Sensei to experiment with different artistic styles. Style transfer technology lets artists automatically apply the structure and detail of one image onto another—previously a tedious process. As a result, Vasjen was able to quickly transfer the style of van Gogh brushstrokes to the organic textures he used to reimagine the Adobe logo. 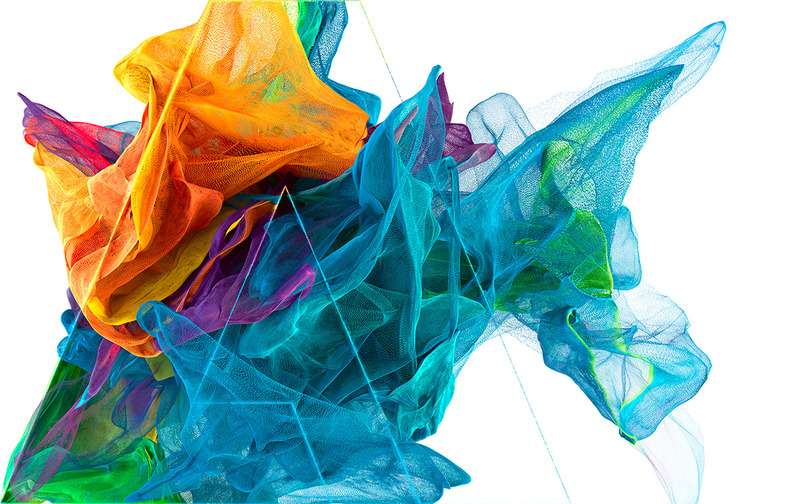 He then combined digital and organic media to finish his work in Adobe Creative Cloud tools. He had never used AI as a tool in his creative process before, so this was a really exciting journey for us all! The project was first unveiled at the 2018 Adobe MAX Creativity Conference. Siddhant Jaokar is an industrial designer turned visual artist from Mumbai, India. His work focuses on building imaginary worlds, and experimenting with colors and textures. 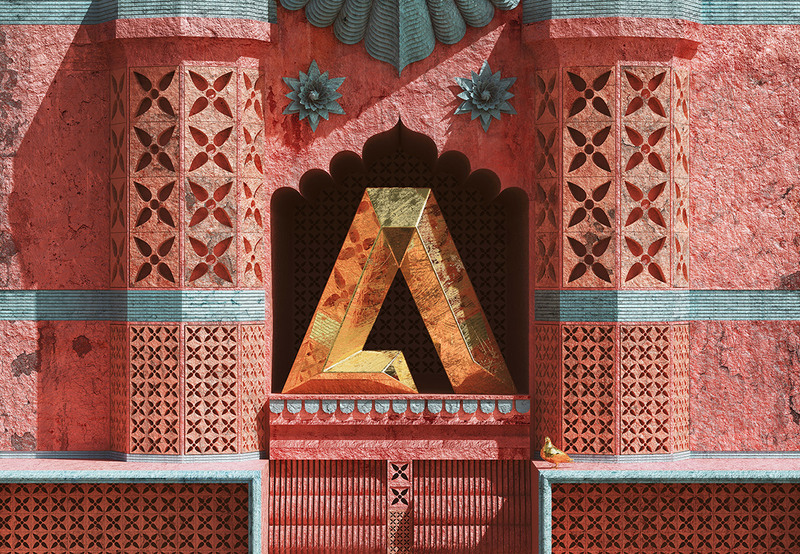 For Adobe Remix, Siddhant digitally created a piece inspired by architectural motifs and patterns native to the Indian region. It launched at the 2018 Adobe Symposium India in Mumbai. Thomas Wirtz’s work focuses on the staging of physical processes. 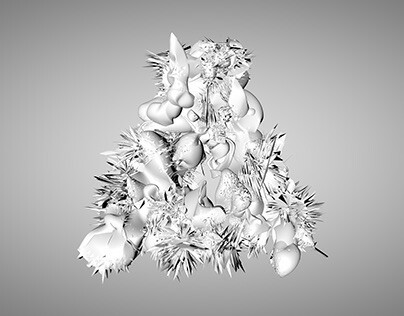 His concept for Adobe Remix, with his partner, Frederic Wiegand, reflected the concepts of construction, deformation and environment. 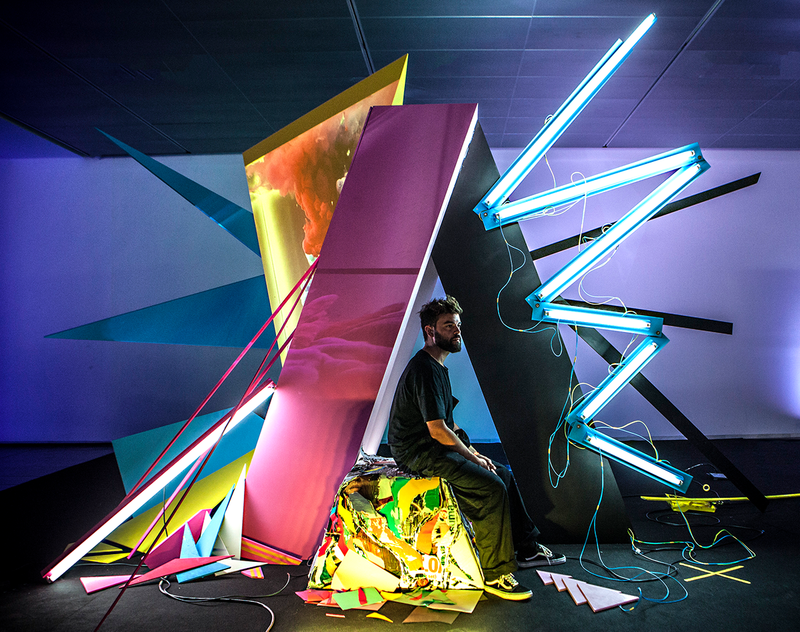 He created three installations that were featured at the 2017 Adobe MAX Creativity Conference. S1T2 which stands for Story 1st Technology 2nd, is a design agency located in Australia. S1T2 brings the narrative experience of storytelling through discoveries which embrace brave, cutting-edge technical environments, virtual and augmented realities, real-time visualization and performance. For Adobe Remix, S1T2 performed the opening act for the 2017 Adobe Marketing Symposium at the Sydney Opera House, where their story was an interpretation of machine learning and A.I. The performance they developed explored the relationship between creatives and their increasingly intelligent tools. The pianist played the role of “The Creative” and brought his inspiration to life on stage by controlling “The Dancer” which was his A.I. muse. The outcome was a kinetic display resulting in the logo. Lauro Samblás is a Spanish visual artist. His work is focused on tri-dimensional illustrations and collages that explore geometry elements saturated with colors and evolving into sculptural pieces. For Adobe Remix, Lauro produced his piece live during the 2017 OFFF Festival in Barcelona, and then also displayed the piece at the D&AD Conference that same year. The art installation recreated a seemingly digital world that was generated manually using reclaimed materials such as paper, pencils, paints and other analog elements to create a contemporary design. His goal was to find a balance between the digital and analog world. Japanese artist Hiroyuki-Mitsume Takahashi’s colorful and illuminated work evokes a vibrant blend of movement and manga-style art. 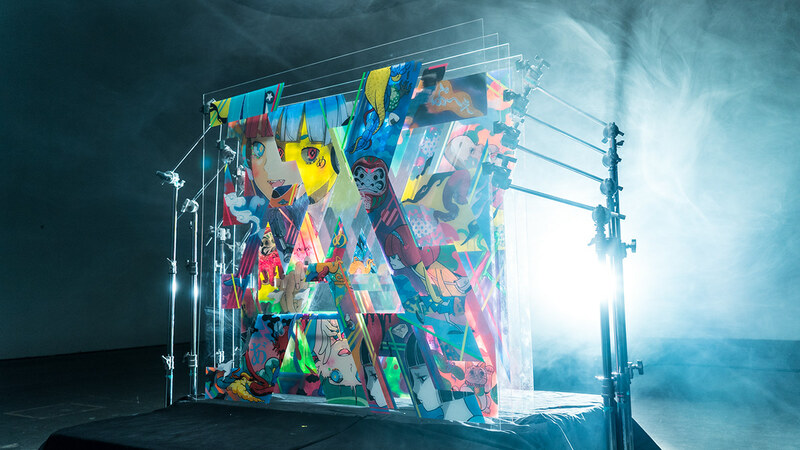 For this Adobe Remix, he created a bright, layered painting, demonstrating the kinetic nature of Japanese pop culture. Sougwen Chung is inspired by the organic language of the natural world, aesthetics of materials science, biological engineering and drawing. 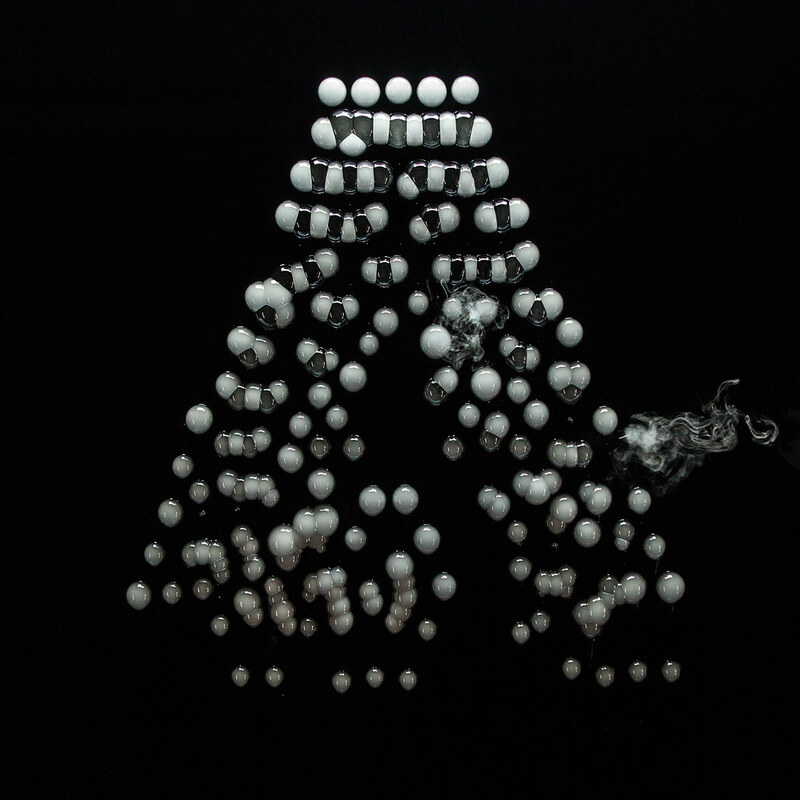 For Adobe Remix, she reimagined the iconic Adobe mark with an organic and sculptural approach, informed by an improvisational drawing process. Jon Noorlander is a Swedish artist who uses 3D technology for his creations. 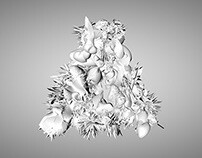 For this Adobe Remix, he created a 3D procedural sculpture, made up of millions and millions of tiny spheres, that took 14,378 CPU-hours to render. The piece lives on as the feature wall in the lobby of Adobe’s San Jose headquarters, with an accompanied video that features close up crops of the main sculpture slowly animating and evolving through time. Takehiro Tobinaga is a Japanese illustrator who is influenced by music and nostalgic material. For this Adobe Remix, he used an analog cut-out animation technique to cut out each element of his illustration, then shot and filmed the pieces, and then edited all elements together into a final animation. 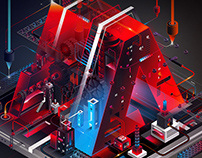 David was inspired to transform the logo into a surreal and isometric mechanical object in the style of his other works. 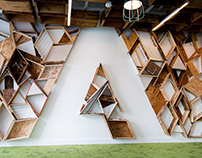 The design is a very detailed and abstracted machine that represents the hidden processes of the Adobe software. Klebebande created their Remix as a live social stunt for Adobe during the Online Marketing Rockstars Festival in Germany in front of over 15,000 attendees. They based the project around their passion for working in layers in Adobe tools. Christopher Bettig created his Remix as a permanent sculpture installation in our corporate headquarters. His draws his inspiration from materials that are organic, basic and universally available with the intention of elevating these basic building blocks to create something more beautiful and complex. The entire sculpture was built onsite and visually integrated into the design of the space which uses vintage produce cases purchased from surrounding farms. 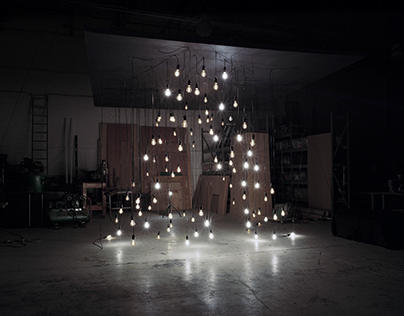 Craig Ward worked with light bulbs to symbolize his inspiration and the coming together of creative minds. 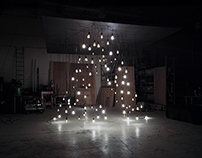 He created a 1700cu/ft installation, suspended in a three dimensional space, using hundreds of light bulbs and anamorphic perspective. Ash Thorp focused his work on motion graphics and a theme called The Incept, which is about the journey from creative inception to finished work—it is a personal narrative and artistic expression about how he was influenced by Adobe’s creative tools. NJ(L.A.) created a user generated audio-visual experience for iOS devices. An app where your screen becomes the window to explore the logo that is manipulated via facial recognition. 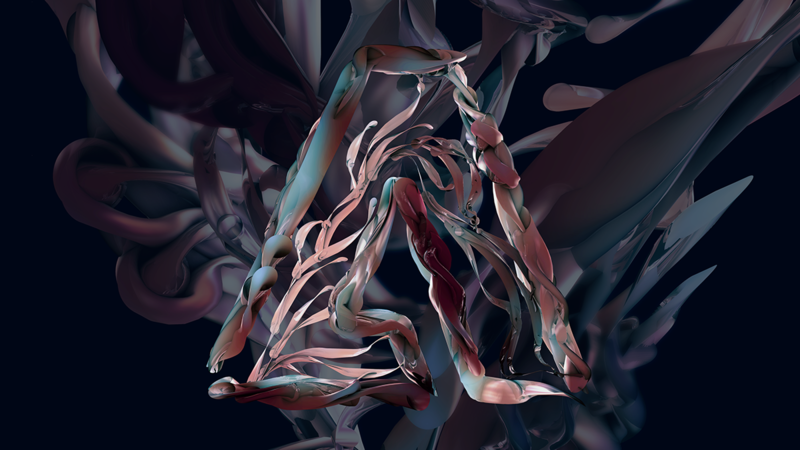 Robert Hodgin is our first coder artist to reinterpret the Adobe Logo in an interactive manner using immersive 3D terrain visualizations. He created a series of animated vignettes that celebrate adobe within the new digital world/ecosystem by surrounding it in an animated terrain all built using code. Janne Parviainen is one of the most well known light painting artists and his work has been featured in various magazines and art blogs such as The National Geographic, The Guardian, Daily Mail, Wired, Juxtapoz, Spiegel Online, Metro News paper, Yahoo News and Japan's Nippon Television. 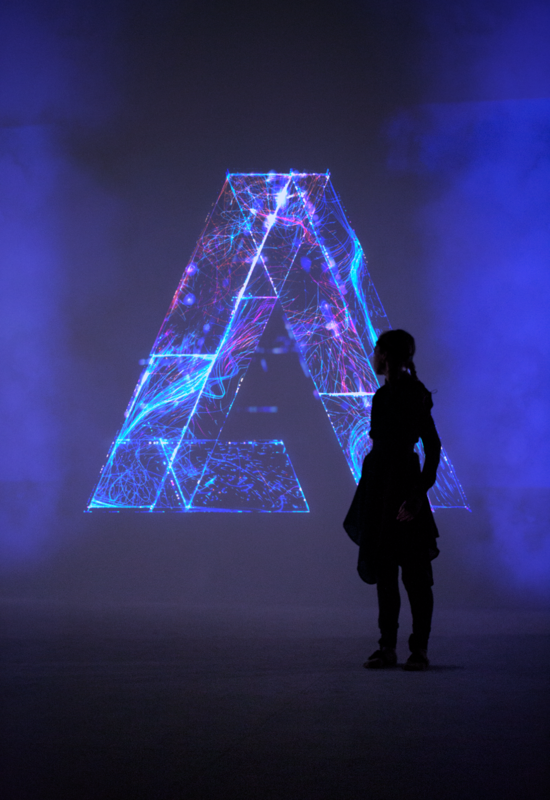 In the Adobe Remix project Janne combines forced perspective drawing with light painting and creates four vivid versions of the Adobe logo. Patrick Tighe is Principal and lead designer of Patrick Tighe Architecture. The firm is committed to creating an authentic, contemporary Architecture informed by technology, sustainability and building innovation. 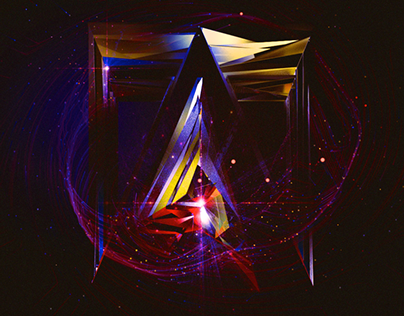 For the work on the Adobe Remix project Patrick transformed the logo by creating a 3D artifact that is not only intriguing in design but functional in form. The design partially obscures the logo by burying it inside a network of lines. 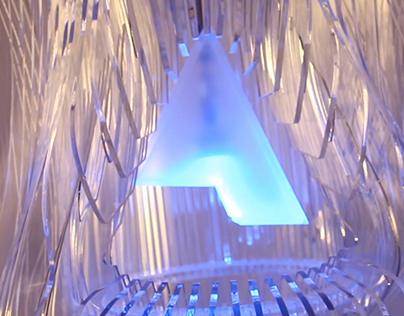 100 blades of glass radiate from the central core and nested within is the original logo. Now that the logo is less visible, the viewer is challenged to look more closely and allowed to see the brand in a new way. Andres Amador celebrates the end of summer by showcasing sand earthscapes. Andres is a San Francisco artist who uses beaches around the world as his canvas. For his work on the Logo Remix he used Illustrator to sketch out his vision and then raked his design into the beach at low tide. The creative took hours to make and the tide took minutes to erase. 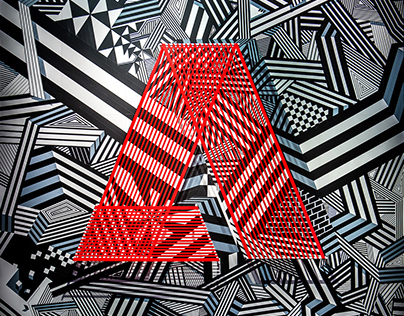 GMUNK's goal was to provide Adobe with an intriguing version of their logo, and interpreted in and reflective of the munkoStylez. The brand was a locked configuration, but the canvas was wide open and Munko and his crew at VT Pro Design certainly intended to play. Adobe products are all about capturing the intangible and opening it up to creative vision. In this same vein of thought, we want to explore ways of containing light itself, using a practical, extruded Adobe logo as the encapsulating vessel. Four executions harness different optical properties to present an ethereal medium with a visceral tangibility. EVB developed their concept around the relationship between 'time and creativity'. As advertisers they believe time dictates their creative process given when an idea is born the clock starts ticking. Last minute fire drills, constant barrage of shifting deadlines, etc.. 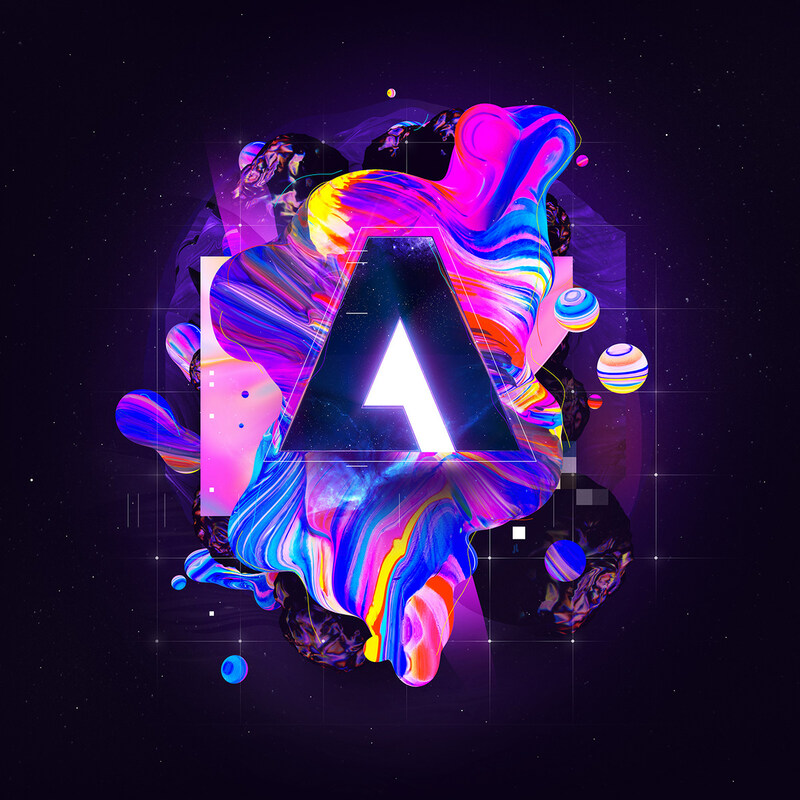 In that world, Adobe helps them tackle these challenges daily so they wanted to shine a light on the delicate relationship between time and creativity by having a renowned animator—Brett Foxwell—take apart pieces of time and put them back together into the Adobe logo. The BETA Group is a team of creative developers, designers, UX specialists and producers that develops software and hardware solutions to real-life problems supporting Goodby Silverstein. They expressed their Remix idea by developing a large physical installation made up of 100 cubes of light, with each cube being assigned to a specific artist. As each artist goes about their day doing their work, expressing their creativity through the software and tools on their computer, the software communicates with their cube in the installation and changes its color to represent the color of the pixel that’s directly under their mouse cursor, literally showing creativity as it happens. Sagmeister & Walsh a NY based design firm that creates identities, commercials, websites, apps, films, books and objects for clients, audiences and themselves. 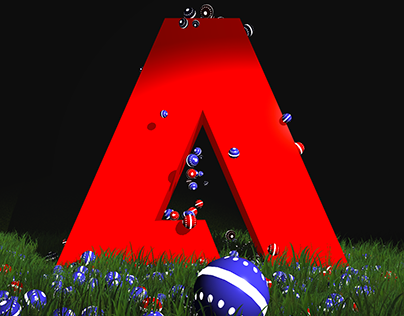 They reinterpret the Adobe logo by having some fun and turning it into a competition. The Made Shop works primarily in graphic design, but their background comes from architecture and object design. They've really enjoyed blurring the distinctions between those fields and getting their hands dirty making physical objects for graphic projects whenever they can. The second Remix is by Alex Trochut who uses a combination of different techniques and materials, such as Neverwet (a super hydrophobic coat on a metal sheet) designed using anamorphosis to enhance the volume of each drop of liquid. Our first Remix is by Natalie Shau, a mixed media Artist and Photographer based in Lithuania. 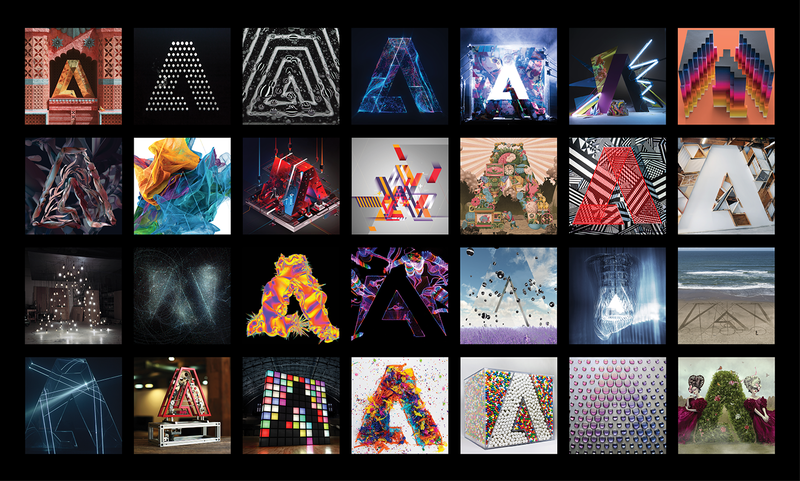 Creative interpretations of Adobe logo by select members of creative community.